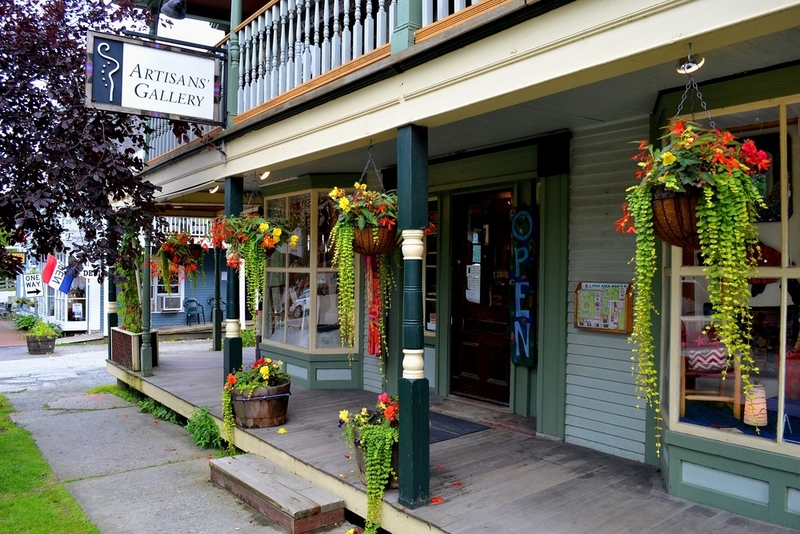 The charming Artisans’ Gallery in Waitsfield, Vermont. Despite the almost Biblical nature of John Milton’s quote, the story at the center of this blog entry is solidly grounded in earthly concerns. Specifically, I tried to frame a mild business setback into something bigger and more painful than it was (not a recommended happiness strategy!) before ultimately choosing a more positive frame — a re-framing which contributed to a happy winter morning for me and everyone else with whom I interacted that day. The story began when Artisans’ Gallery severed our 12-year relationship (detailed below). It was just a moment in my long life, but here’s the thing: all we have are moments. In each one of our precious moments, we choose. With both minor and major life choices, our minds can make any situation more heavenly or more hellish. In this way, we shape our lives and we impact the lives of others. Thus, every moment is important. Positive psychology offers a variety of tools to help our minds choose a happier path. In my Artisans’ Gallery story, I used re-framing, benefit finding, and consideration of my personal intersection of talent, meaning, and pleasure. Aristotle said, “Where your talents cross with the needs of the world lies your vocation.” Add meaning and pleasure and, well, my departure from Artisans’ Gallery was long overdue. I was doing exactly the wrong thing last week when I made the beautiful drive down scenic Route 100 to Artisans’ Gallery. “Hell” is a bit strong, and so is “Heaven” — but on a very low key level, as I drove, my mind was trying hard to turn a good situation into one of pain and suffering. It was like I was mentally picking a scab to make it bleed. You see, my mission in going to this charming, consignment gallery was to pick up the remaining pieces of my watercolor jewelry in stock because they were no longer selling. Artisans’ Gallery had written me an apologetic note, asking me to remove my work and make way for a new artist. Their request wasn’t unexpected — my check for December had been a measly $16.00 — but I had enjoyed my relationship with this gallery. Now, I was the jilted party. Theoretically, that’s a bad role to occupy, so I kept trying to make it hurt. Only, there was no pain and suffering. I was actually happy to close this door. That’s because,the re-frame was so obvious. My work life as a happiness activist and advocate is quite full. There is no room anymore for me to paint watercolor pins and earrings. The letter from Artisans’ Gallery liberated me and them from our outdated relationship. Further, making these tiny art pieces is no longer in concordance with my values. Oh, I certainly believe in and treasure having art and beauty in our lives, but when I began making my jewelry in the 1990s, I did not consider the environmental impact of using copious amounts of nail polish (to seal the watercolor paintings) and other chemicals I used in the process. I still have some leftover chemicals, so I could kinda justify making more, but, I really didn’t want to. My conscience protested the very idea. If happiness is found in the nexus of meaning and pleasure, as Tal Ben-Shahar suggests, it was long past time to say goodbye to Artisans’ Gallery. When you throw in Aristotle’s advice to combine one’s own strengths with society’s needs … well, I have more important strengths to meet deeper societal needs than painting happy jewelry (which was fun, I’ll admit, but that is not where I am anymore). As for benefit finding, there is still one gallery I am working closely with, a gallery in my home town of Montpelier. The pieces I picked up from Artisans’ Gallery are mostly pretty nice items I can now deliver to Artisans Hand. Also, my community has a very sweet craft show every December, and I love being one of its exhibitors. It is such a social occasion! I had thought perhaps this last December was my final opportunity to be part of that show, since I am finally running out of stock. Now, I can be part of that show at least one more time. The biggest benefit, though, is that I am increasingly feeling the need to say no to some parts of my life in order to say yes to other, higher priority activities. Artisans’ Gallery made that “no” easy. I’m grateful for that. The bottom line is, I arrived at Artisans’ Gallery in a very chipper mood. When I told the woman behind the counter why I was there, she immediately put on a sad face and began, so sympathetically, to tell me how much the gallery hates this part of the business. “No,” I said, “it’s really fine. I stopped making these a long time ago. No wonder they aren’t selling!” She visibly relaxed and we had a pleasant chat as I packed up. Turns out, she’s related to some of my neighbors. We had a good time exploring that connection. My mood remained high at my next stops, and the one after that. Finally, it was time for the first meeting of one of the “Meditating for Happiness” classes I am teaching. Coming from a re-framed, benefit finding, living in concordance with my talent and meaning stance, I was smiling and happy with all these folks, taught them well, and received smiles and happiness and good learning beamed right back at me. What a great day! I was spinning in a cycle of happiness hour after hour, giving and receiving loving human connection. In other words, heaven on earth.